Now, all of a sudden, John the Baptist walks onto the pages of Scripture. If we had Matthews gospel only, we would ask, “where did he come from and what is his background. ?”- because Matthew gives us none of that, and the reason is obvious. The prophet Malachi had said that the messenger would come ahead and make away for the coming of the King. In the book of Malachi it says “Behold, I will send my messenger; and he shall prepare the way before me...” This messenger was John the Baptist. You don't really need to know about the background of a messenger. When a western Union boy delivers a message to your door; do you say to him, “Young man, did your ancestors come over on the mayflower? What is your background?” Your not interested in that. You are interested in the message because the message is all-important, and that is what you want. So you thank him, give him a tip, and dismiss him. You are through with him. Now lets deal with these expressions: 1.”Do penance” 2.”The Kingdom of heaven” 3.”Is at hand”. They are very important. There are a few misconceptions concerning what penance is, so let us deal with them. First of all, the penance John the Baptist was calling for here in this scripture is not the sacramental penance of the Church. The Greek word for the word Penance is metanoia,- me-tä-no-e'-ō meaning “to change the mind”. But when you read other passages of scriptures concerning penance you will see that the definition comes a little short of what the bible says about Penance. The full biblical definition of repentance is a change of mind that results in a change of action. Be penitent, therefore, and be converted- To turn from a bad life to a good one. I preached, that they should do penance, and turn to God, doing works worthy of penance. “Penance” as used by John the Baptist was applied in the Old Testament sense of turning to God as His people, turning from spiritual adultery and idolatry in which the Jews were living. They were unfaithful to Jehovah, and this certainly demanded personal penance, personal turning to God. John was the Baptist was calling upon the people of God to turn from their idols and spiritual adultery. He was pleading with them to turn to Jehovah and serve Him as a people. When I say John preached the message of penance I am saying that he preached a message that said that people must have a sorrow for sin. But understand that there is more to his message then a sorrow for sin. When a person exorcises true penance, that person will be sorry for his sins; but sorrow for sin is not penance. That is not enough. Sorrow for sin “works” penance, but sorrow for sin is not penance. To do penance is to be sorry for sin and to change the mind about sin. When one truly does penance, he will bring forth fruits which proves that he has repented. 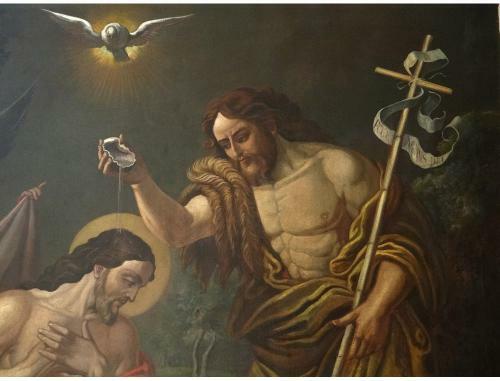 That is the reason John the Baptist called the Pharisees a “generation of Vipers” They came to him to be baptized, but they did not bring forth works worthy of Penance. They had not had a change of mind or heart, they still lived as they lived before they came to him to be baptized. The Apostle Paul, preaching on Mars' Hill, declared “And God indeed having winked at the times of this ignorance, now declareth unto men, that all should everywhere do penance.” (Acts 17:30) A self-righteous person will never repent of sin. First man must see that in himself he is depraved. He must recognize that he is a sinner, and then he must recognize that God is a God of mercy and has provided salvation. Realizing his lost condition, man will change his mind about sin, himself, and God.